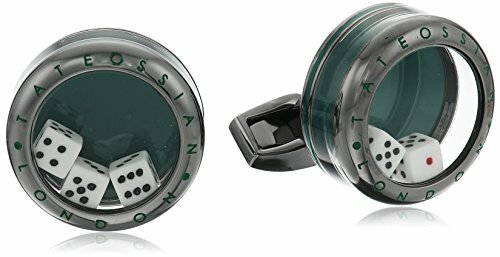 Tateossian Poker Dice Cufflinks | What Should I Say? Small dice have been captured in this cleverly designed piece. There are 2 dice in the left side and 3 in the right. The number 1 has been enameled in bright red. The background is an opaque enamel finish which matches with an intricate ring of opaque enamel around the edge of the cufflink. If you have any questions about this product by Tateossian, contact us by completing and submitting the form below. If you are looking for a specif part number, please include it with your message.